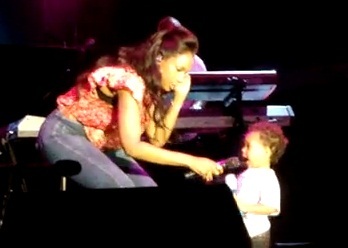 *Jennifer Hudson surprised the crowd at a show in Barbados last night by bringing her young son on stage to sing with her…and he handled his biz. At the ripe old age of 18 months, David Otunga, Jr. made his stage debut alongside his mama during her concert at Barbados’ Holder House venue. cute kid…..now get’em off the stage before you fall on something!